This consultation closed on 8 March 2019. Submissions are invited from interested stakeholders on Stage 1 of the APVMA’s approach to spray drift management. This is a supplemental consultation on the Stage 1 approach after incorporation of changes identified from the previous consultation. The purpose of the proposed spray drift management approach is to introduce refinements to buffer zone calculations; provide clearer label instructions, increased flexibility for pesticide applications; and support the use of drift reducing technologies (DRT). The previous public consultation on the APVMA’s proposed approach to spray drift management was open from 18 December 2017 to 30 March 2018. A total of 26 responses were received. See the following link for a copy of the submissions that can be made publically available and a summary of APVMA responses to the submission (Summary of responses to initial consultation). An extension was requested by the National Working Party on Pesticide Applications (NWPPA) to consider revisions to the ground deposit curves and the APVMA worked with the NWPPA technical working group to refine the deposition curves. This work was finalised in August 2018. The following documents and files all form part of the spray drift management approach. See the following link for major changes in documents compared to version in initial consultation (Summary of changes). Spray Drift Risk Assessment Manual (SDRAM): overarching document that describes the framework and its elements. 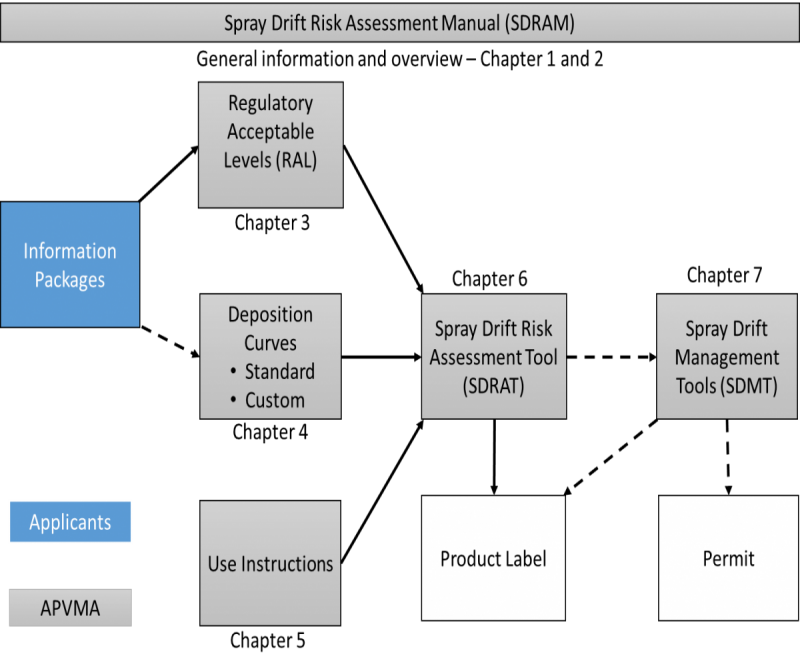 Spray Drift Risk Assessment Tool (SDRAT): used by the APVMA to conduct a risk assessment of the realistic worst-case scenario for the use of each product to generate buffers for different sensitive areas. The tool will generate the wording to appear on the product label. The tool will also be available to applicants to conduct self-assessments prior to submitting an application. Spray Drift Management Tool (SDMT): used by the APVMA for assessing DRTs. Spray Drift Data Guidelines (SDDG):describes how information and data related to spray drift management (spray drift data) may be generated and submitted. Standard scenarios: AGDISP input files used for realistic worst case scenarios for boom sprayer, fixed wing and helicopter. Output from these scenarios is used in SDRAT. Droplet Size Distributions (DSD): standard APVMA spectra used to determine boundaries for fine, medium, coarse, very coarse, extremly coarse and ultra coarse droplet size classifications. These can be imported into AGDISP. DSD converter ensures that droplet size distributions from different testing facilities can be compared and be consistent relative to the APVMA DSD. Under the spray drift management approach, there are no changes to the current items and modules for registration applications. Applicants would continue to submit relevant information packages to allow the Regulatory Acceptable Levels (RAL) to be determined. The method used to determine the RAL is described in Chapter 3 of the SDRAM. Standard deposition curves (outlined in Chapter 4 of the SDRAM and scenario files) will be used to determine buffer zones based on realistic worst case scenarios. Applicants will also have an option to provide information to determine custom deposition curves. The SDDG describe how spray drift information and data may be generated and submitted. The approved RAL and deposition curve would be entered into the SDRAT that is described in Chapter 6 of the SDRAM. The SDRAT contains approved label instructions (Chapter 5 of the SDRAM) and will be used to generate the label instructions, including buffer zones and spray drift restraints. The SDMT will be used by the APVMA to include buffers, relevant to the use of DRTs, on labels or permits as described in Chapter 7. When state legislation can support it, users may in the future be able to recalculate buffers according to their specific equipment, application rate, weather conditions etc that are relevant to their own circumstances (Stage 2). The proposed framework will initially only apply to new chemistries and chemical reviews. Revised ground boom deposit curves. Mandatory verses advisory buffer zones. The consultation period is open until close of business on 8 March 2019. Following consideration of comments received during the consultation period, stage 1 will be finalised and made available on the APVMA website by 30 April 2019. Further consultation will be required prior to introduction of stage 2. All submissions will be published unless you state in your submission that you do not want your submission to be published.